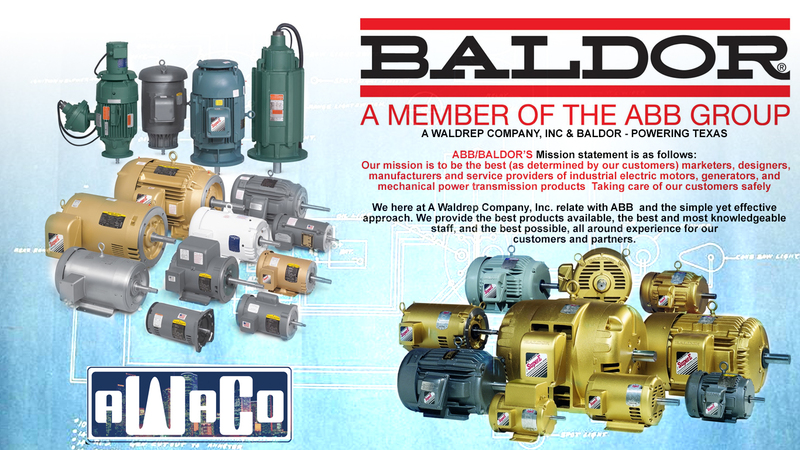 ABB/BALDOR is one of the manufacturers A Waldrep Company, Inc. represents in and around Houston. Like all the manufacturers we represent, ABB/BALDOR is an industry leader and offers a wide range of advanced motors and drives. We have a huge stock of motors here in Houston we can have ready for you in will call for same day pick up. If its not in stock, we can order it from one of their many warehouses across the country. ABB/BALDOR has 15 manufacturing operations in 8 states,and has been innovating since 1920. A Waldrep Company, Inc. strives to partner with time tested and trusted brands such as ABB/BALDOR to provide the best equipment in the industry to you and your customers.